Los Angeles was the site of a “revolution in clay” in which a small group of artists challenged studio pottery’s traditional focus on utilitarian ware to create sculptural forms. One of the central figures, John Mason, emerged as a sculptor of power, creating new works in clay that claimed equal footing with art in other media. Mason went on to work with clay and space as a visionary. In his Hudson River Series, Mason turned to manufactured fire bricks as a medium, and distinctly revealed his deep interest in the role of the viewer and his fascination with the process of perception. 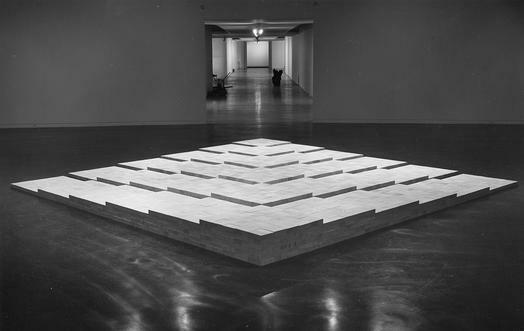 This exhibition of his work at the Williamson Gallery of Scripps College features an installation that Mason created in preparation for the series, one that lays the foundation of his thinking for the work yet to come. While doors open on Aug. 25, 2018, the formal opening of the exhibit takes place on Sat., Sept. 15 from 7 to 9 pm and features live music and light refreshments. The exhibition and the opening are free and open to the public. This unusual exhibit focuses on one firebrick installation, consisting of approximately 4,500 bricks—a recreation of an early work, one predating the series that would monopolize Mason’s thoughts and work for much of the 1970s. Mason said of these works, “We’re dealing with measurement, we’re dealing with interval, we’re dealing with progression, we’re dealing with sequence…and it’s all immediately visible.” At the center of the work is the simple firebrick. In the 1970s, Mason began thinking about those bricks and exactly what he could do with them. Built into firebrick surfaces, Mason realized, was an infinite number of possible effects having to do with texture, color, and variable arrangement. He saw that the work, when viewed from an increasing number of vantage points, would disclose ever more information about its surface and its relationship to the viewer. While the geometry of the sequence was immediately visible, one’s experience of its materiality was elusive.